Established in the early 1970s the coarse fishery at Upham Farm enjoys an excellent national reputation for providing superb carp and tench fishing for all types of anglers, from beginners of all ages to seasoned professionals. Features six well stocked spring fed ponds sited in a gentle sloping valley surrounded by farmland amid the picturesque East Devon countryside. 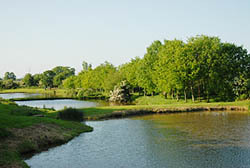 A seventh large specimen pond opened in April 2009. Day tickets start at £7, for more details on this venue, visit their website.